Compact design and low weight for mobile use. Powerful pneumatic drive with sensitive control. Heavy duty professional series winch features JDN's patented integrated-brake motor and air-cooled gearbox designs for increased durability. 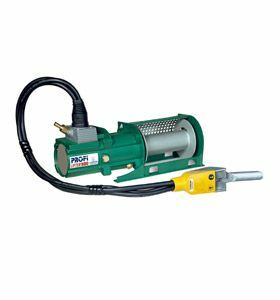 The Profi series motor is also equipped with an internal self-lubrication system eliminating the need for additional external air lubrication. Infinitely variable lifting and pulling is achieved with either the rugged push button station or manual lever controls. Drum geometry allows for high rope capacities up to 5 layers with a free-spooling clutch standard on the pulling version. Small footprint is perfect for tight clearances. Ideal for use in hazardous areas with explosion classification - Ex II 3 GD IIA T4(X). FOB Shipping Point. Product No. Cap. (lbs.) Lifting Pulling Speed (fpm) Rope Cap. 3/16 in. 1/4 in. Free-Spool Clutch Wt. (lbs.) Price Ea.